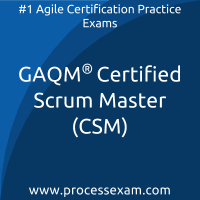 Test yourself using our GAQM Certified Scrum Master (CSM) Premium practice exam. Be firm and assured on your readiness for your GAQM Scrum Master certification exam preparation. Our GAQM CSM certification practice exam gives you a platform to test your knowledge on a set of refined and recently updated questions. The GAQM Scrum Master Questions Bank contains 115+ Questions, our premium Certified Scrum Master certification practice exam will randomly populate questions from this question bank. All the questions of premium question bank will be covered easily in 6 to 8 practice exam attempts. However the more you practice, the best will be the result in real exam. With the purchase of this product, you will get an access to the following Premium Practice Exams for 2 months, unlimited practice attempts. This Premium practice exam will give you the feeling of real GAQM Agile Framework certification exam environment with exam time limit and random selection of questions from premium CSM question bank.